The 2015 International Building Code issued by the International Code Council, Inc., 4051 West Flossmoor Road, Country Club Hills, IL, 60478, one (1) full edition of which has been and are on file in the Office of the Clerk of the City of St. Charles, Illinois, for more than thirty (30) days, together with the amendments listed in Section 15.04.015 hereof, are hereby adopted as the regulations governing the construction of buildings and structures within the City of St. Charles, except for one- and two-family dwellings and townhouses not more than three stories in height, which are covered by Section 15.04.020. (For adoption of administrative provisions in Chapter 1 of the International Building Code, see Chapter 15.101). 1. Townhouse: A single family dwelling unit constructed in a group of 3, 4, 5, or 6 attached units in which each unit extends from foundation to roof and with open space on at leasttwo( 2) sides. Dwelling units where more than six (6) units-are attached shall be governed by code provisions applicable to multiple family dwellings, rather than the provisions of this one( 1) and two( 2) family dwelling code. 2. Amend Section 410.7" Automatic Sprinkler System" by deleting exceptions # 2. 706.3 Materials: Firewalls shall be constructed of approved masonry materials or other similar approved product or assembly. 903.2 Where required. Notwithstanding;any language to the contrary, that is contained elsewhere in this code, an approved automatic sprinkler system installed inaccordance with the provisions of all,applicable codes and standards shall be provided and maintained in full operating condition throughout every story and basement of all Use Groups as listed in Section 302. 4 of the International Building.Code. a. The-structure is continually monitored byan approved automatic firealarm system. The requirements, contained in these exceptions, shall bersubject to modifications by the authority having jurisdiction to compensate for particular building conditions to meet the intention of the code. This requirement shall be subject to modifications by the authority havingjurisdiction to compensate for particular building conditions. 6. Delete the provisions of Section 907.2" Where required" and substitute the following therefore: 907.2 Where Required: An approved fire alarm system installed in accordance with the provisions ofthis code and NFPA 72 shall be provided in new buildings and structures in accordance with Sections 907.2.1 through 907.2.23 and provide occupant notification in accordance with 907.5, unlessother requirements are provided by another section of this code. Notwithstanding any provision of Section 907 and its,subsections to the contrary,an approved manual fire alarm signaling system shall betinstalledand,maintained in all buildings over one( 1) stoiy in height or over 1, 000 square feet. 7. Delete the provisions ofSection 907.6.6. 1 " Automatic Telephone-Dialing Devices." 912.1 Installation. The type( Siamese, Storz) and size of the fire department connection shall be in accordance with the NFPA standard applicable to the system design and shall be subject to approval of the FirvDeparlment, based'upon an analysis of the building's size and use group.,Generally, a 5- inch size, Storz type connection with a 30 degree downward is required. 9. Add' subparagraph 6 to Section" 1008.3. 3 Emergency Power for Illuminating" as follows: 6. In all rooms and spaces over 1, 000 square feet in area with an occupancy load of 20 or more and all mechanical rooms. (a) For requirements for occupancies in Group I-2, see Section 407.3. (b) For a reduction in the fire-resistance rating of occupancies in Group I-3, see Section 408.7. (c) Buildings equipped throughout with an automatic sprinkler system in accordance with Section 903.3.1.1 or 903.3.1.2 where allowed. (d) Glass permitted in wall. Il. Delete Section 180TI A' Permanent Wood Foundation Systems" in their entirety. Specific location: The geographic location and distances to other structures, rivers, streams, and other use groups. Zoning: The proximate distances to Assembly, Educational, Institutional, and Residential uses and vacant land zoned for these uses. Types of hazardous materials which are not allowed: Materials listed in Section 307.3 High Hazard Group H-1 that present a detonation hazard shall not be permitted under any circumstances. Allowable construction types: Type I and II only. The provisions of the 2015 International Residential Code for One and Two Family Dwellings, published February 2015 by the International Code Council, Inc., 4051 West Flossmoor Road, Country Club Hills, IL 60478 (hereinafter sometimes referred to as “the IRC”), not less than one (1) copy of which have been and are on file in the Office of the Clerk of the City of St. Charles, Illinois for more than thirty (30) days, together with the amendments listed herein, are hereby adopted as the regulations governing the construction of one and two family dwellings and townhouses not more than three stories in height. B. Section R105.2 Work exempt from permit: Delete this section. C. Section R105.2.3 Public service agencies: Delete this section. “R106.3.1 Approval of construction documents. When the Building Official issues a permit, theconstruction documents shall be approved in writing or by stamp. One set of the approved construction documents as reviewed shall be retained by the Building Official. The other set shall be returned to the applicant and shall be kept on the site of the project and shall be open to inspection by the Building Official or his or her authorized agent/representative." I. Section R109.1.3 Flood plain inspection: Delete this section. J. Section R110.1 Use and occupancy: Delete the exceptions. K. Section R110.3 Certificate issued: Delete lines 3, 5, 7, 8, and 9. A. Change the stated term MANUFACTURED HOME to MANUFACTURED/MOBILE HOME. "TOWNHOUSE. A single family dwelling unit constructed in a group of 3, 4, 5 or 6 attached units in which each unit extends from foundation to roof and with open space on at least two sides. Dwelling units where more than six units are attached shall be governed by code provisions applicable to multiple family dwellings, rather than the provisions of this one and two family dwelling code." See captions under Table R301.2 (1) in the book for exceptions and conditions of approvals. B. Section R301.2.4 Floodplain construction. Delete this section. C. Section R302.1 Exterior walls: Delete exceptions 1 & 2. "R302.2 Townhouses. Each townhouse, as defined in this code, shall be constructed as a separate single-family dwelling unit and shall be separated by a minimum of an approved 2-hour UL rated assembly, which shall extend vertically from the foundation to the underside of the roof sheathing and horizontally the full length of the common wall. The number of single family dwelling units attached in this manner shall not exceed six (6)." E.2 Section R302.3 Two family dwellings: Delete the exceptions. “R311.7.5 Landings for stairways. A minimum of 3-foot by 3-foot landing shall be required on each side of an egress door. The floor or landing shall not be more than 1 ½- inches lower than the top of the threshold. Exception No. 2: The requirement for the installation of automatic fire sprinkler systems in townhouses is deferred until December 31, 2019. Exception No. 2: The requirement for the installation of automatic fire sprinkler systems in one- and two-family dwellings is deferred until December 31, 2019.
b. Outside of each separate sleeping room or area, within 15-feet of all bedrooms. c. On each additional story of the dwelling, including basements and cellars, but not including crawl spaces and uninhabitable attics. d. In dwellings or dwelling units with split-levels. For the purpose of this section each split-level shall be considered a story. When more than one (1) smoke alarm is required to be installed within an individual dwelling unit, the alarm devices shall be interconnected in such a manner that the actuation of one (1) alarm will activate all of the alarms in the dwelling unit. The alarm shall be clearly audible in all bedrooms over background noise levels, with all intervening doors closed. T. Section R322 Flood resistant construction: Delete this section. B. Section R402.1, 402.1.1, 402.1.2: Delete these sections. C. Section R403.1 General: Delete the words “wood foundation” within the first sentence. G. Figure R403.1 (2) Permanent Wood Foundation Basement Wall Section: Delete this figure. 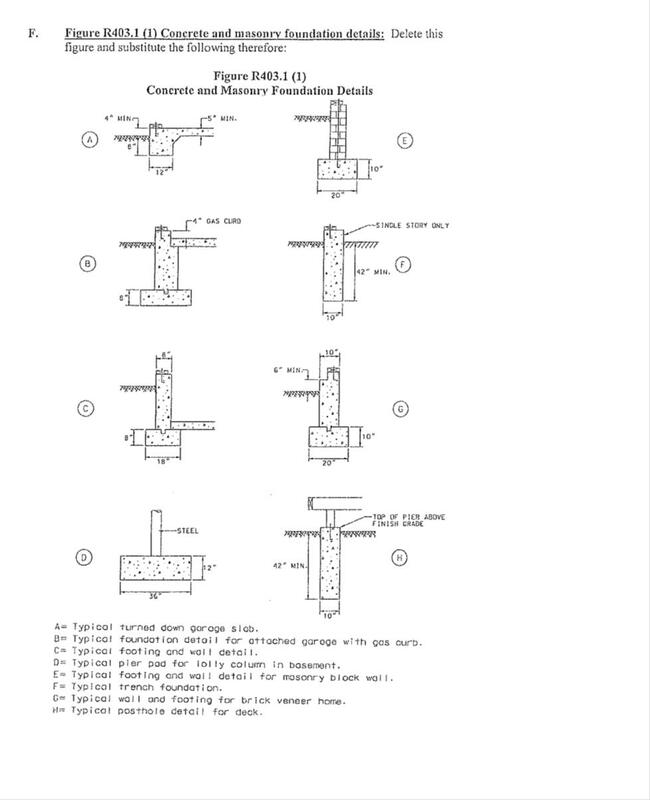 H. Figure R403.1 (3) Permanent Wood Foundation Crawl Space section: Delete this figure. I. Section R403.2 Footings for Wood Foundations: Delete this section. J. Section R404.1.5.3 Pier and Curtain Wall Foundations: Delete this section. K. Section R404.2 Wood Foundation Walls: Delete this section. L. Sections R404.2.2 Stud Size and R404.2.3 Height of Backfill: Delete these sections. M. Table R404.2.3 Plywood Grade and Thickness for Wood Foundation Construction: Delete this table. N. Sections R404.2.4 Backfilling; R404.2.5 Drainage and Damp Proofing; and R404.2.6 Fastening: Delete these sections. O. Sections R405.2 and R405.2.1 through R405.2.3 Wood Foundations: Delete these sections. P. Sections R406.3 Damp Proofing of Wood Foundations: R406.3.1, R406.3.2, R406.3.3, and R406.3.4: Delete these sections. Q. Section R407.1 Wood Column Protection: Delete this section. 1. The minimum application of one layer of 5/8-inch drywall and draft stopped per Section 502.12 of the 2006 International Residential Code. D. Section R504 Pressure Preserved Treated Wood Floors (on ground): Delete this section. B. Section R602.3.2 Top Plate: Delete the exception. C. Table 602.10.2 Intermittent Bracing Methods: Delete methods number four (4) SFB and five (5) GB. A. Delete Chapter 22 in its entirety. - Appendix F – “Radon Control Systems” - Delete Figure AF102. The provisions of the 2015 International Swimming Pool & Spa Code issued by the International Code council Inc., 4501 West Flossmoor Road, Country Club Hills, IL 60478, not less than one (1) copy of which have been and are on file in the Office of the Clerk of the City of St. Charles, Illinois for more than thirty (30) days, together with the amendments listed herein, are hereby adopted. a. Section 105.5.3 Expiration – delete in its entirety. b. Section 105.5.4 Extensions – delete in its entirety. c. Section 105.6.3 Fee Refunds – delete in its entirety. d. Section 107.4 Violation Penalties – delete in its entirety. e. Section 108 Means of Appeal = delete in its entirety. The provisions of the 2015 International Mechanical Code issued by the International Code Council Inc., 4051 West Flossmoor Road, Country Club Hills, Il 60478, not less than one (1) copy of which have been and are on file in the Office of the Clerk of the City of St. Charles, Illinois for more than thirty (30) days, together with the amendments listed herein, are here by adopted. The provisions of the 2015 International Fuel Gas Code issued by the International Code Council Inc., 4051 West Flossmoor Road, Country Club Hills, IL 60478, not less than three (1) copies of which have been and are on file in the Office of the Clerk of the City of St. Charles, Illinois for more than thirty (30) days, together with the amendments listed herein, are hereby adopted. 1. Chapter 1 Scope and Administration. The City has adopted a separate Administrative Code under the Municipal Code Chapter 15.101. A. Section 403.5.4 “Corrugated Stainless Steel Tubing” – Delete in its entirety. The provisions of the 2014 Edition of the National Electrical Code, NFPA 70, issued by the National Fire Protection Association, Inc., One Batterymarch Park, Quincy, Massachusetts, 02269 (hereinafter sometimes referred to as the “NEC”) not less than three (1) copies of which have been and are on file in the Office of the Clerk of the City of St. Charles, Illinois, for more than thirty (30) days, together with the amendments listed herein, are hereby adopted. Other than service conductors provided by the Utility or multiplexed aerial cables as allowed in Article 396 Section 396.2(4) that comply with Article 310, all conductors shall be copper unless otherwise specifically approved by the City of St. Charles Building and Code Enforcement or the City of St. Charles Electric Utility. (A) Mounting. All electric panels mounted on concrete or masonry walls that are either exterior walls or below grade, shall have a minimum of 1/2 inch plywood installed behind the panel, or the panel shall be mounted to structural mounting channel that provides a minimum 1/2 inch airspace between the panel and the wall, for the purposes of support and to help prevent moisture entering the panel. Such mounting shall allow panel replacement if required. (D) Illumination of Mechanical Equipment. All occupancies shall have luminaries installed within four (4) feet of the front of all electric panels and within four (4) feet of mechanical heating equipment to enable servicing the equipment. (1) Multiple-occupancy buildings where there is no available space for service equipment accessible to all occupants. (2) A single building or other structure sufficiently large to make two or more services necessary. 230.3 One Building, or Other Structure, or Tenant Space, Not to be Supplied Through Another, Service conductors, feeders, or branch circuits of one building, or other structure, or tenant space shall not pass through the interior of another building, or structure, or other space. (5) Installed in any “common area” (hallway, corridor or common space accessible to multiple premises) that meets the construction requirements of a one-hour fire rating. Conductors shall be installed in solid metal raceway pipe within “common areas” and shall have a label every five (5) feet identifying the conductors within the conduit. 230.46 Spliced conductors: Splices in service entrance conductors, other than those installed by the Electric Utility, are not allowed. (1) Readily Accessible Location. Service disconnecting means shall be provided either outside the building or through a shunt trip main with remote control at the Fire Control Panel and shall have provisions to allow the service to be locked open. Each building/tenant space shall have a main disconnect incorporated within the main distribution panels inside the space in addition to any external main or building shunt trip main for multiple occupancy buildings. g. Section 230.70 General (A) Location: (3) Remote Control: revise by deleting and substituting the following: Where a remote control device (s) is used to actuate the service disconnecting means, the service conductors installed inside a building without over current protection shall not exceed five (5) feet in length. C) One or Two Family Dwelling: All electric panel installations for new single family detached dwellings shall be a minimum of 200 -ampere rated. The main service disconnecting means ( circuit breaker or fused switch) shall be 200 -ampere rated. D) Multi -family and Single-family Attached Dwellings. All apartment or dwelling unit electric panel installations for new multi -family dwellings and new single family attached six (6) or less dwelling units shall be a minimum of 100 - ampere rated. The occupancy main service disconnecting means ( circuit breaker or fused switch) for each apartment or dwelling unit shall be a minimum of 100 -ampere rated. E) All Others. For all other installations, the service disconnecting means shall have a rating of not less than 60 -ampere, unless approved by the City of St. Charles Municipal Electric Utility. a. Section 250.24 Grounding Service -Supplied Alternating -Current Systems (A) System Grounding Connections (1) General: Revise by deleting and substituting the following: The grounding electrode conductor connection from each grounding. b. electrode shall be made at a single point at the terminal or bus to which the grounded service conductor is connected at the service disconnecting means. c. Section 250.53 Grounding Electrode System Installation (D) Metal Underground Water Pipe (2) Supplemental Electrode Required: revise by deleting and substituting: A metal underground water pipe shall be supplemented by an additional electrode of a type specified in 250.52 ( A) (2- 8). If the additional is a rod type as specified in 250.52 ( A) (5), then electrode must also have a supplemental additional electrode of a type specified in 250.53 ( A) (2) unless as noted in 250.53 A) (2) Exception the first supplemental electrode has a resistance to earth of 25 ohms or less as evidenced by a fall -of -potential test witnessed by the City of St. Charles Municipal Electric Utility. Supplemental electrodes shall be connected with a grounding electrode conductor to the grounded service - entrance conductor at the service main disconnecting means. d. Section 250.62 Grounding Electrode Conductor Material: revise by deleting and substituting the following: All grounding electrode conductors shall be copper, and the installation of the conductor shall protect against corrosion. Conductors of the wire type shall be solid or stranded, and insulated, or covered, or bare. C) Continuous: revise by deleting and substituting the following: Grounding electrode conductor(s) shall be installed in one continuous length without a splice or joint. E) Raceways and Enclosures for Grounding Electrode Conductors. (1) General: revise by including additional language as follows: Ferrous metal raceways and enclosures for grounding electrode conductors shall be electrically continuous from the point of attachment to cabinets or equipment to the grounding electrode and shall be securely fastened to the ground clamp or fitting. Ferrous metal raceways and enclosures shall be bonded at each end of the raceway or enclosure to the grounding electrode or grounding electrode conductor. All grounding electrode conductor raceways that are exterior and exposed above grade shall be ferrous metal RMC or IMC conduit. Schedule 40 rigid PVC conduit is permitted for grounding electrode conductor raceways installed both above grade and underground in the interior of a building, as well as exterior underground if the entire raceway is -completely below grade. Schedule 40 rigid PVC grounding electrode conductor raceways are not required to be electrically continuous. F) Installation to Electrode(s). revise by deleting and substituting the following: Unless granted a specific exemption by the City of St. Charles Municipal Electric Utility, all grounding electrode conductors and raceways must be installed separately and continuously from each grounding electrode to the service grounded conductor neutral) grounding/bonding termination point at the service main disconnect. f. Section 250.68 Grounding Electrode Conductor and Bonding Jumper Connection to Grounding Electrodes (C) Grounding Electrode Connections: revise by deleting ( 1) exception; and substituting the following for: (2) The metal structural frame of a building can only be used as a bonding conductor for a grounding electrode conductor by specific approval of the City of St. Charles Municipal Electric Utility. g. Section 250.118 Types of Equipment Grounding Conductors: Revise by deleting and substituting the following: 250.118 Types of Equipment Grounding Conductors: The equipment grounding conductor must be a separate conductor run with the circuit conductors unless given exemption by the City of St. Charles Municipal Electric Utility or an approved certified testing agency. (1) With the exception of one and two family dwellings, all current carrying conductors exceeding 50 volts shall be installed in rigid metal conduit, intermediate metallic conduit, electrical metallic tubing, flexible metallic tubing, MC cable, or AC cable, with the exception that PVC conduit may be used with the approval of the City of St. Charles Building and Code Enforcement Department for corrosive or other special application areas. c. Section 300.5 Underground Installations, (D) Protection from Damage, (3) Service Conductors: Revise by deleting and substituting the following: (3) Service Conductors. Single and two family dwelling underground service conductors shall be installed in minimum 3" Schedule 40 PVC. All other underground service conductors shall be installed in RMC, IMC, or Schedule 40 PVC conduit that is encased in concrete unless given exemption by the City of St. Charles Municipal Electric Utility. d. Table 300.5 Minimum Cover Requirements, 0 to 1000 Volts, Nominal, Burial in Millimeters (Inches): Delete the third row table entries related to Under a Building. e. Table.300.5 Minimum Cover Requirements, 0 to 1000 volts, Nominal, Burial in Millimeters (Inches): Revise by deleting and substituting the fourth row to read as follows: Table 300. 5 Minimum Cover Requirements, 0 to 1000 Volts, Nominal, Burial in Millimeters (Inches). Under minimum of 102 mm (4 inch) thick concrete interior or exterior slab with no vehicular traffic and the slab extending not less than 152 nun ( 6 inch) beyond the underground installation. a. I1 Installation: Section 310. 10 Uses Permitted (If) Conductors in Parallel (3) Separate Cables or Raceways: revise by deleting and substituting: Where run in separate cables or raceways, the cables or raceways with conductors shall have the same number of conductors and shall have the same electrical characteristics. All conductors of a circuit shall have the same physical and electrical characteristics. b. Section 310. 106 Conductors (B) Conductor Material. Revise by deleting and substituting the following: (B) Conductor Material. Other than service conductors provided by the Utility, or multiplexed aerial cables as allowed by Section 396. 2 ( 4) that comply with Article 310, all conductors shall be copper unless otherwise specifically approved by the City of St. Charles Building and Code Enforcement Department or the City of St. Charles Municipal Electric Utility. a. Section 3143 Nonmetallic Boxes. Delete this section. b. Section 314. 17 (C) Nonmetallic Boxes and Conduit Bodies. Delete this section. a. Section 334.40 Boxes and Fittings (A) Boxes of Insulating Materials. Revise by deleting and substituting the following: Nonmetallic outlet boxes are only permitted for use in corrosive applications as determined and approved by the City of St. Charles Building and Code Enforcement Department. b. Section 334.40 Boxes and Fittings (B) Devices of Insulating Materials: Delete this section. 10. Article 695 Fire Pumps: Section 695.3 Power Source(s) for Electric Motor –Driven Fire Pumps, (B) Multiple Sources ( 2) Individual Source and On -Site Standby Generator (a) Signage: Add new paragraph to read as follows: Where a generator provides a secondary source for a fire pump, and the generator feeds other systems, clearly marked key operated shunt trip switches must be provided at the fire panel allowing Fire Department personnel the ability to open main breakers to panels not feeding the fire pump. 11. Article 700 Emergency Systems Section 700.16 Emergency Illumination: Add new paragraph to read as follows: (1) Additional spaces that require emergency lighting shall include all restrooms and mechanical rooms. (D) Transfer Equipment Requirements: Open type transfer switches are the only approved method for connection of standby systems. All transfer switch connections shall be " break before make" to insure the complete separation from the utility system and the generator supply. No parallel operation with the utility system shall be allowed. A minimum time delay of three (3) seconds and a maximum of ten (10) seconds after loss of utility power should be established before starting the generator. Utilization of Kirk Key systems or other mechanical means of isolating generating sources from the utility source are not allowed. 6) Generator Noise Output. The maximum noise level allowable within ten (10') feet of transformer, switchgear, or other specified equipment as required and operated by the City of St. Charles Municipal Electric Utility (SCMEU) is 80dBA decibels). Sound enclosures or sound barrier walls or other sound mitigation may be required if the noise level near SCMEU equipment exceeds 80dBA. Analysis of the need for sound abatement equipment will be performed by the City of St. Charles Municipal Electric Utility personnel after the generator is installed and tested. The provisions of the 2015 International Energy Conservation Code issued by the International Code Council, Inc., 4051 West Flossmoor Road, Country Club Hills, IL 60478, not less than one (1) copy of which have been and are on file in the Office of the Clerk of the City of St. Charles, Illinois, for more than thirty (30) days, as hereby adopted. The provisions of the 2015 International Existing Building Code issued by the international Code Council Inc., 4051 West Flossmoor Road, country Club Hills, IL 60478, not less than one (1) copy of which have been and are on file in the Office of the Clerk of the city of St. Charles, Illinois for more than thirty (30) days, together with the amendments listed herein, are hereby adopted. 1. Chapter 1 – Scope and Administration. The City has adopted a separate Administrative Code under the Municipal Code Chapter 15.101. Any owner or owner’s authorized agent who intends to construct, enlarge, alter, repair, move or the demolition of a building or structure or to erect, install, enlarge, alter, repair, remove, convert or replace any electrical, gas, mechanical or plumbing system, the installation of which is regulated by the City’s adopted code, or to cause any such work to be performed, shall first make application to the Building Official and obtain the required permit. The requirements under Title 18, Flood Damage Prevention, shall be followed in connection with all proposed construction, substantial improvements, or other development within floodplain areas. No building permit shall be valid for a period of more than one year from the date of issuance.